All those six a.m. walk/jogs at the lake Anna and I have been doing for the past two months have paid off. Our time today was roughly 39:28- a whole 7 minutes faster than my time at Woodstock! Plus, I wasn't wheezing, purple-faced, and limping this time. I didn't even have any shin pain! (Sore shins has been the worst problem since I've started running). As you can see from that top photo, it was a costume race. 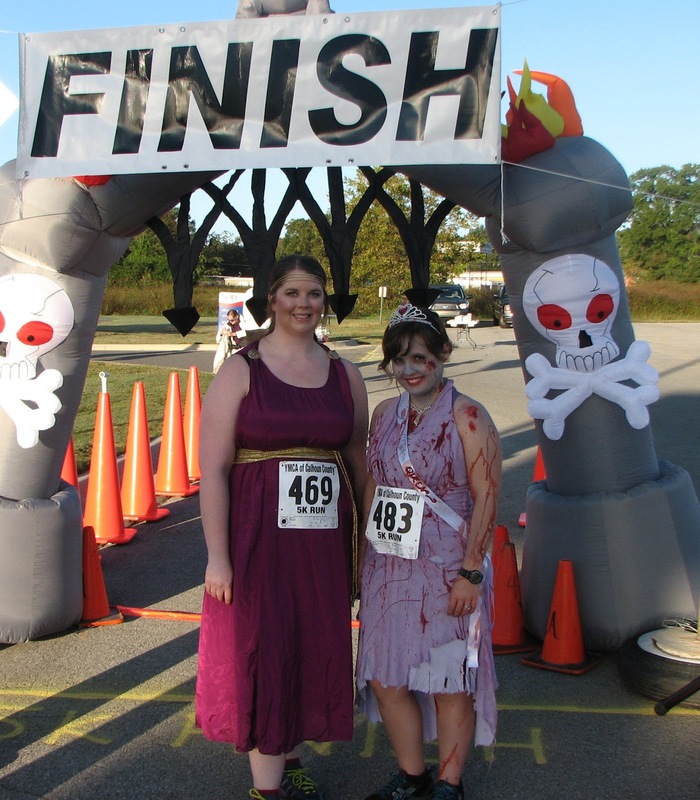 I went as a Greek goddess and Anna was a Carrie-inspired zombie prom queen. I found a shimmery fuschia mumu-looking dress and a trashy, lopsided gold Christmas bow at the thrift store for a total of $7. I removed the wire from the bow and turned it into a belt. I found a couple of gold medallion buttons at Walmart for $1 each, and I attached them to the sleeve area, which I gathered. Also at Walmart, I got the braided rope headband for $4 and the gold cuff bracelet for $6, bringing this surprisingly comfortable costume to a total of $19. I added some waterproof mascara, 24-hour gold eyeshadow, and about three layers of foundation to finish the look. Yeah. We had way too much fun making her costume. And...guess what? She won Creepiest Costume! 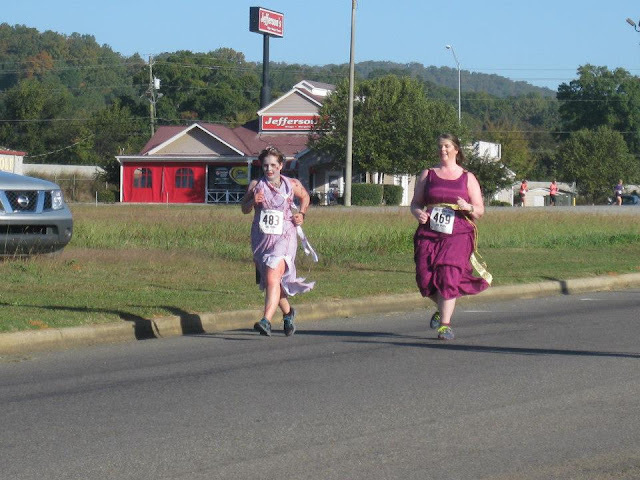 Both of us were surprised at how comfortable and easy to run in our costumes were. We took some extra precautions by pinning our crowns into place, but other than that, we didn't do anything special. Except, of course, making sure our dresses were short enough to not trip us. I ran into a few friends from my old workplace too, which was awesome. It was great to see them again! And...here's a nice shot of us on the track! Sooo, another incredible experience. I'm already planning my next one- a Christmas-themed race in early December.